Download "DEPARTMENT OF ENVIRONMENTAL QUALITY Environmental Assessment"
1 DEPARTMENT OF ENVIRONMENTAL QUALITY Environmental Assessment Water Protection Bureau Name of Project: Applicant: Ueland Land Development LLC Type of Project: Proposed discharge of treated domestic wastewater to ground water under the Montana Ground Water Pollution Control System (MGWPCS) permit program. Location of Project: SE ¼ SE ¼ Section 15 Township 02, Range 07 West, Platt 286B. 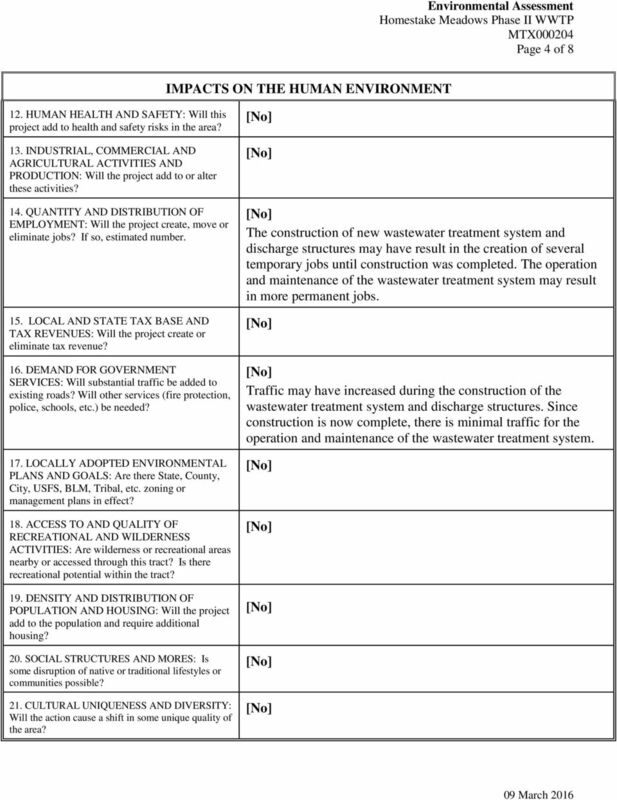 Latitude: º; Longitude: º City/Town: Butte, County: Silver Bow County Description of Project: This Environmental Assessment (EA) is for a renewal of the MGWPCS permit for the (facility). The proposed MGWPCS permit reauthorizes the Permittee (permittee) to discharge treated wastewater from a subsurface discharge structure (Outfall 001) into Class I ground water. The scope of this EA addresses the operation and discharge of the proposed wastewater treatment and disposal system. The magnitude and significance of potential impacts are summarized below (see #26 below). Agency Action and Applicable Regulations: The proposed action is to reissue an individual MGWPCS permit that contains effluent limits and effluent monitoring requirements. 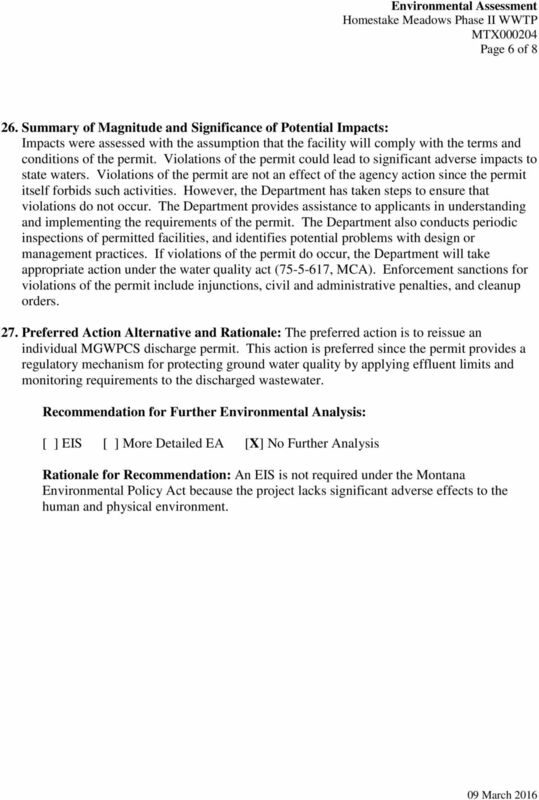 The permit is issued under the authority of the Montana Water Quality Act (MCA et seq. 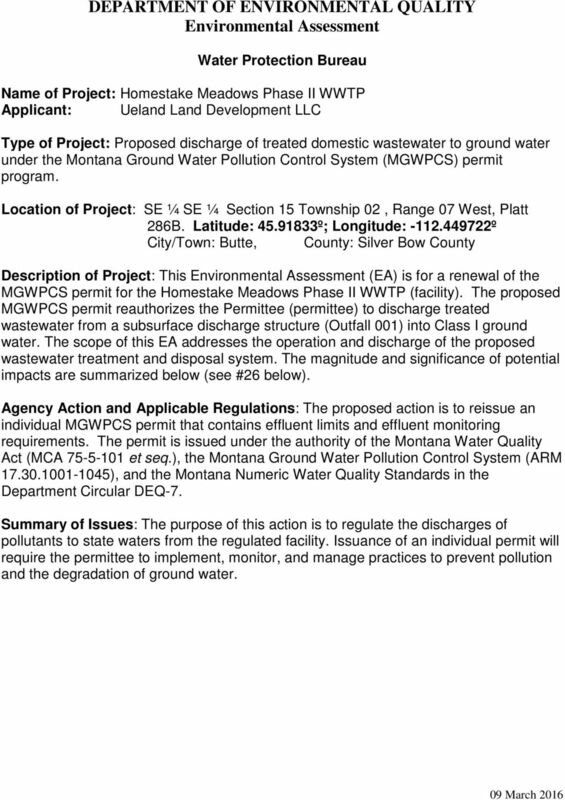 ), the Montana Ground Water Pollution Control System (ARM ), and the Montana Numeric Water Quality Standards in the Department Circular DEQ-7. Summary of Issues: The purpose of this action is to regulate the discharges of pollutants to state waters from the regulated facility. Issuance of an individual permit will require the permittee to implement, monitor, and manage practices to prevent pollution and the degradation of ground water. 2 Affected Environment & Impacts of the Proposed Project: Y = Impacts may occur (explain under Potential Impacts). N = Not Present or No Impact will likely occur. Environmental Assessment Page 2 of 8 IMPACTS ON THE PHYSICAL ENVIRONMENT RESOURCE 1. GEOLOGY AND SOIL QUALITY, STABILITY AND MOISTURE: Are soils present which are fragile, erosive, susceptible to compaction, or unstable? Are there unusual or unstable geologic features? Are there special reclamation considerations? 2. WATER QUALITY, QUANTITY AND DISTRIBUTION: Are important surface or groundwater resources present? Is there potential for violation of ambient water quality standards, drinking water maximum contaminant levels, or degradation of water quality? 3. AIR QUALITY: Will pollutants or particulate be produced? Is the project influenced by air quality regulations or zones (Class I airshed)? 4. VEGETATION COVER, QUANTITY AND QUALITY: Will vegetative communities be significantly impacted? Are any rare plants or cover types present? 5. TERRESTRIAL, AVIAN AND AQUATIC LIFE AND HABITATS: Is there substantial use of the area by important wildlife, birds or fish? [Y/N] POTENTIAL IMPACTS AND MITIGATION MEASURES No significant impacts have been identified. The soils and geology have not and are unlikely to be adversely impacted. The facility covered under this permit must show evidence of treatment capable of meeting the established effluent limitation which was derived from the most restrictive ground water quality standards and nondegradation-nonsignificance criteria. This effluent limitation, along with special conditions and standard conditions of the permit has been developed to maintain the beneficial uses of all state ground waters including drinking water. Facilities must be able to meet this restrictive effluent limitation prior to discharge. No air pollutants or particulates will be generated. Natural Heritage Database was consulted and no vegetative communities would be significantly impacted. No vegetative or animal species of concern were noted in the area. Natural Heritage Database was consulted and no vegetative communities would be significantly impacted. No vegetative or animal species of concern or their habitats were noted in the area. 3 Page 3 of 8 IMPACTS ON THE PHYSICAL ENVIRONMENT 6. UNIQUE, ENDANGERED, FRAGILE OR LIMITED ENVIRONMENTAL RESOURCES: Are any federally listed threatened or endangered species or identified habitat present? Any wetlands? Species of special concern? 7. SAGE GROUSE EXECUTIVE ORDER: Is the project proposed in core, general or connectivity sage grouse habitat, as designated by the Sage Grouse Habitat Conservation Program (Program) at: 8. HISTORICAL AND ARCHAEOLOGICAL SITES: Are any historical, archaeological or paleontological resources present? 9. AESTHETICS: Is the project on a prominent topographic feature? Will it be visible from populated or scenic areas? Will there be excessive noise or light? 10. DEMANDS ON ENVIRONMENTAL RESOURCES OF LAND, WATER, AIR, OR ENERGY: Will the project use resources that are limited in the area? Are there other activities nearby that will affect the project? Will new or upgraded power line or other energy source be needed? 11. IMPACTS ON OTHER ENVIRONMENTAL RESOURCES: Are there other activities nearby that will affect the project? See #4 and #5 above. All discharge disposal structures must meet the minimum set back requirements of ARM , which includes surface water, flood plains, and springs. Site and habitat inventories for the applicable species were recommended in consultation with the Montana Natural Heritage Program. 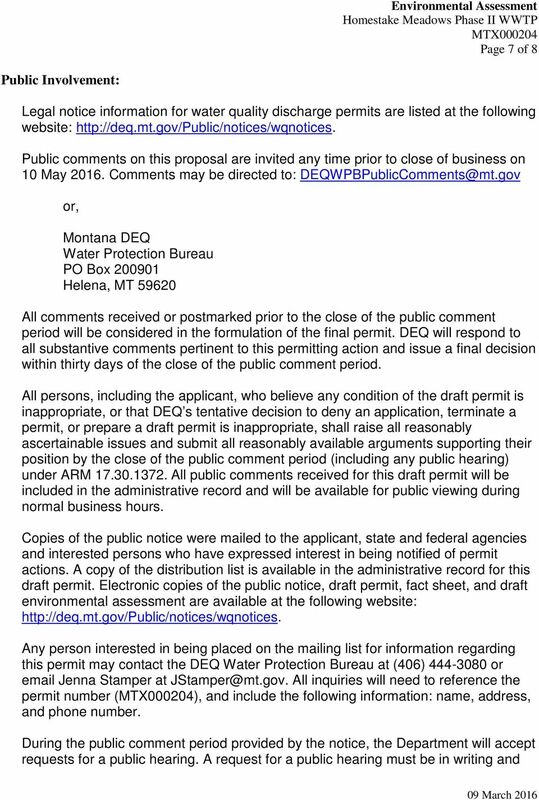 The applicant is encouraged to contact and consult with this program or other Natural Resource Information Programs available at the Montana State Library: The project is not listed as being within sage grouse habitat. 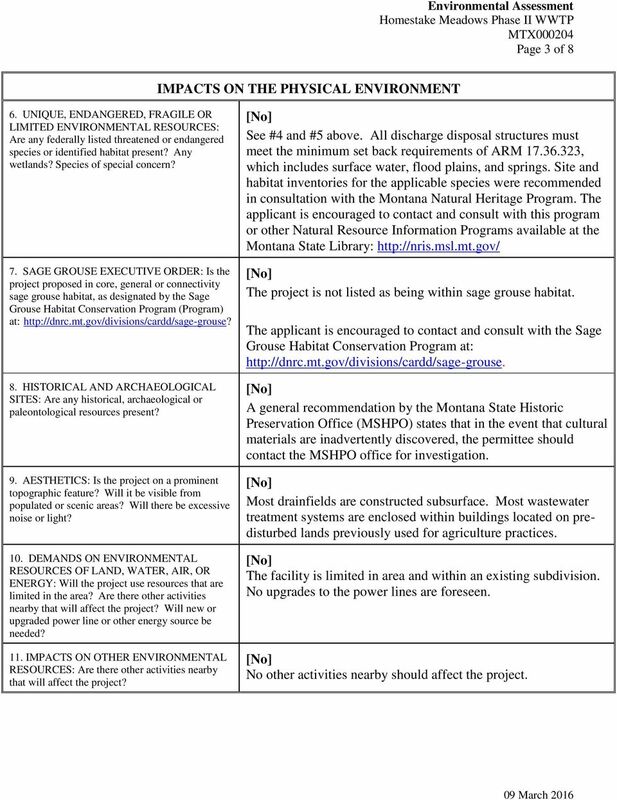 The applicant is encouraged to contact and consult with the Sage Grouse Habitat Conservation Program at: A general recommendation by the Montana State Historic Preservation Office (MSHPO) states that in the event that cultural materials are inadvertently discovered, the permittee should contact the MSHPO office for investigation. Most drainfields are constructed subsurface. Most wastewater treatment systems are enclosed within buildings located on predisturbed lands previously used for agriculture practices. The facility is limited in area and within an existing subdivision. No upgrades to the power lines are foreseen. No other activities nearby should affect the project. 4 Page 4 of 8 IMPACTS ON THE HUMAN ENVIRONMENT 12. HUMAN HEALTH AND SAFETY: Will this project add to health and safety risks in the area? 13. INDUSTRIAL, COMMERCIAL AND AGRICULTURAL ACTIVITIES AND PRODUCTION: Will the project add to or alter these activities? 14. QUANTITY AND DISTRIBUTION OF EMPLOYMENT: Will the project create, move or eliminate jobs? If so, estimated number. 15. LOCAL AND STATE TAX BASE AND TAX REVENUES: Will the project create or eliminate tax revenue? 16. DEMAND FOR GOVERNMENT SERVICES: Will substantial traffic be added to existing roads? Will other services (fire protection, police, schools, etc.) be needed? 17. LOCALLY ADOPTED ENVIRONMENTAL PLANS AND GOALS: Are there State, County, City, USFS, BLM, Tribal, etc. zoning or management plans in effect? 18. ACCESS TO AND QUALITY OF RECREATIONAL AND WILDERNESS ACTIVITIES: Are wilderness or recreational areas nearby or accessed through this tract? Is there recreational potential within the tract? 19. DENSITY AND DISTRIBUTION OF POPULATION AND HOUSING: Will the project add to the population and require additional housing? 20. SOCIAL STRUCTURES AND MORES: Is some disruption of native or traditional lifestyles or communities possible? 21. CULTURAL UNIQUENESS AND DIVERSITY: Will the action cause a shift in some unique quality of the area? The construction of new wastewater treatment system and discharge structures may have result in the creation of several temporary jobs until construction was completed. The operation and maintenance of the wastewater treatment system may result in more permanent jobs. Traffic may have increased during the construction of the wastewater treatment system and discharge structures. Since construction is now complete, there is minimal traffic for the operation and maintenance of the wastewater treatment system. 5 Page 5 of 8 IMPACTS ON THE HUMAN ENVIRONMENT 22. OTHER APPROPRIATE SOCIAL AND ECONOMIC CIRCUMSTANCES: 23(a). PRIVATE PROPERTY IMPACTS: Are we regulating the use of private property under a regulatory statute adopted pursuant to the police power of the state? (Property management, grants of financial assistance, and the exercise of the power of eminent domain are not within this category.) If not, no further analysis is required. 23(b). PRIVATE PROPERTY IMPACTS: Is the agency proposing to deny the application or condition the approval in a way that restricts the use of the regulated person's private property? If not, no further analysis is required. 23(c). PRIVATE PROPERTY IMPACTS: If the answer to 23(b) is affirmative, does the agency have legal discretion to impose or not impose the proposed restriction or discretion as to how the restriction will be imposed? If not, no further analysis is required. If so, the agency must determine if there are alternatives that would reduce, minimize or eliminate the restriction on the use of private property, and analyze such alternatives. The agency must disclose the potential costs of identified restrictions. [No ] No significant impacts were identified in 23(b). 24. Description of and Impacts of other Alternatives Considered: A. 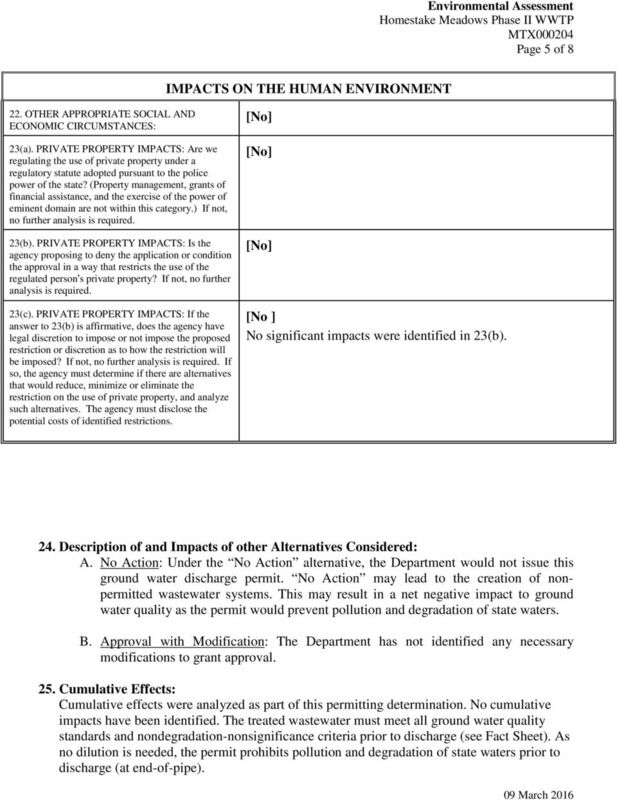 No Action: Under the No Action alternative, the Department would not issue this ground water discharge permit. No Action may lead to the creation of nonpermitted wastewater systems. This may result in a net negative impact to ground water quality as the permit would prevent pollution and degradation of state waters. B. Approval with Modification: The Department has not identified any necessary modifications to grant approval. 25. Cumulative Effects: Cumulative effects were analyzed as part of this permitting determination. No cumulative impacts have been identified. The treated wastewater must meet all ground water quality standards and nondegradation-nonsignificance criteria prior to discharge (see Fact Sheet). As no dilution is needed, the permit prohibits pollution and degradation of state waters prior to discharge (at end-of-pipe). 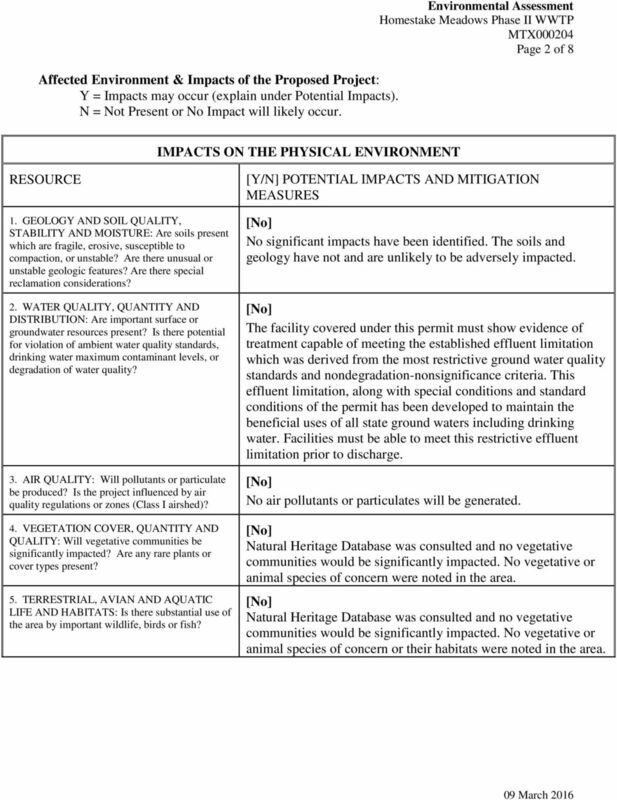 6 Page 6 of Summary of Magnitude and Significance of Potential Impacts: Impacts were assessed with the assumption that the facility will comply with the terms and conditions of the permit. Violations of the permit could lead to significant adverse impacts to state waters. Violations of the permit are not an effect of the agency action since the permit itself forbids such activities. However, the Department has taken steps to ensure that violations do not occur. The Department provides assistance to applicants in understanding and implementing the requirements of the permit. The Department also conducts periodic inspections of permitted facilities, and identifies potential problems with design or management practices. If violations of the permit do occur, the Department will take appropriate action under the water quality act ( , MCA). Enforcement sanctions for violations of the permit include injunctions, civil and administrative penalties, and cleanup orders. 27. Preferred Action Alternative and Rationale: The preferred action is to reissue an individual MGWPCS discharge permit. This action is preferred since the permit provides a regulatory mechanism for protecting ground water quality by applying effluent limits and monitoring requirements to the discharged wastewater. 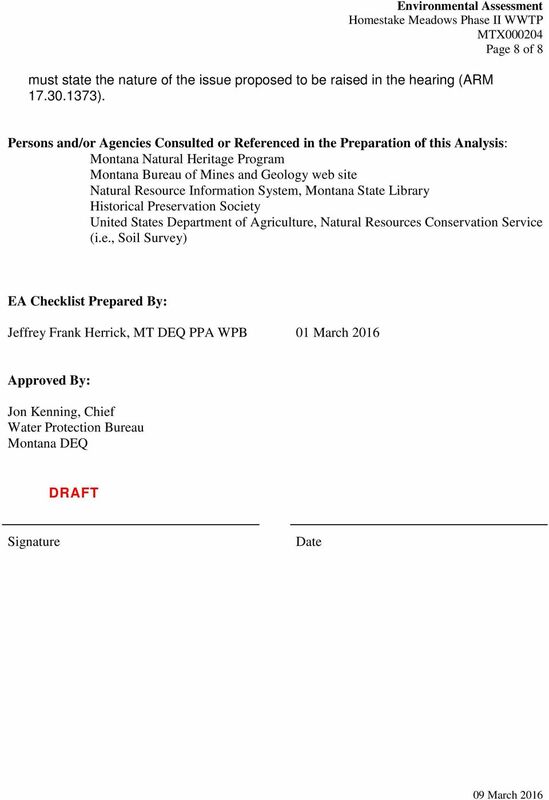 Recommendation for Further Environmental Analysis: [ ] EIS [ ] More Detailed EA [X] No Further Analysis Rationale for Recommendation: An EIS is not required under the Montana Environmental Policy Act because the project lacks significant adverse effects to the human and physical environment. DEQ Response to Comments regarding the Public Notice for a Coal Mining Project in the Panther Creek watershed In Craig and Nowata Counties.